The web is buzzing! Something which was due to come, sooner or later, has happened. 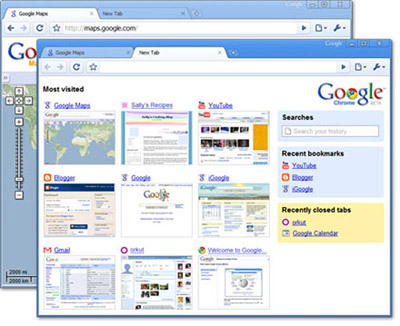 Google is launching their own web browser today: Google Chrome. 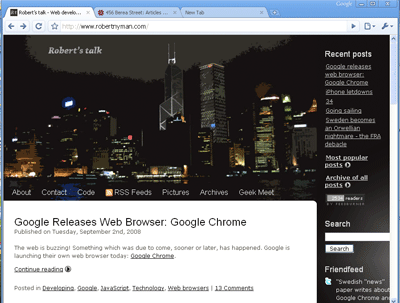 Screenshot taken from TechCrunch: First Images of Google Chrome, who in turn took it from the Google Chrome web site (which currently is taken down). Unfortunately, though, the first version will only be for Windows but Mac and Linux versions seem to be just around the corner. It should also be mentioned that it is completely open-source, so adaptions or parts not perfect will most likely be found and seen to by the community. They have also issued a comic describing in more detail how it works, both technically and for end users, and the benefits they see in their approach. This information, somewhat abridged, can also be found in the Wikipedia article about Google Chrome. The rendering engine in Google Chrome will be WebKit, so if you haven’t mastered its benefits as well as shortcomings, you’ll have to start doing your homework now. Personally, I like WebKit since it’s crazy fast and they have implemented a lot of nice features, although my gut feel is that Gecko is overall more solid. What’s most important here is that Google Chrome, Safari, Android, Adobe AIR and others try to keep as updated with the WebKit team’s work as possible. Otherwise we will have to tend to numerous versions of WebKit which will make web developing life hell. One of the most interesting things about Google Chrome is that each tab in the web browser will run its completely own process, effectively meaning that the content in one tab can crash without bringing down the entire web browser. This way you will be able to see which web site is being unresponsive or slow, see how much memory it consumes, and, in practice, see which web sites were built properly and which weren’t. Way back I hoped for a Google Firefox. Seems I was only halfway right: they released a web browser, but not based on Firefox. Either way, I do think this is great news! With the power of the name Google (and especially with the press coverage that comes with it) and the very interesting separate-processes and V8 features, I’m sure this will set a new standard and push other web browsers even harder. With the recent success of Firefox and Safari, and now Google coming into the game, I think Microsoft will have a really hard time keeping up. IE 8 brings improvement, but when actually released, they will already be far behind; basically, Microsoft moves to slow and have problem with their priorities. So, stay tuned! It will be released very soon, and I’m sure it will have a great impact on the web browser market. The layout engine is WebKit, so I am a happy man. I am really liking what the team behind WebKit is doing and it's good to see more support for it, especially from a company like Google. I don't think WebKit being used by so many different companies would be a problem. It's an advanced layout engine which is constantly being improved. Yes, you might not see some bleeding-edge improvements in all devices, but it's not like we'll ever see WebKit implementations lagging six years behind reality (I am looking at you, Microsoft). I'll definitly download it and I'm very interestet if there's an impact on how we make web sites (I mean how and if we will still concentrate on certain browsers). But I also think that in big IT environments it will always be the blue E. And always the version 3 years ago. "IE 8 brings improvement, but when actually released, they will already be far behind" – But, ie 8 is released in beta. Do you think chrome will ever loose its beta status given google's track record? I'll definitely be giving this a go. I use Flock for keeping all my social stuff in one place – I wonder if Google's approach will improve on that in any way… interesting times ahead. I spent most of my morning today reading the comic and various blog posts about this buzz, and I have to say I'm excited! If Chrome will work as well as Google promises, than it's going to be one helluva nice browser. Still, it's a little weird considering Google's alliance with Mozilla. I'm curious as to what the future will bring for these two companies, especially if their forces stay joined. I think it looks very interesting and I will definitely download and try it out. Hopefully this will reduce the number of IE-users even further as well. What Andreas said: every change to reduce the number of IE-users is good. I'll dowload it and test it. But I'm not really sure I should be happy about one market dominator's browsers trying tot take the place of the previous market dominator. And I read a post on another site today where the issue was raised what user input Google was gonna be keeping track of with it's new browser. Which I think is a question which needs a thorough answer with Google's track record. I certainly will download it. I have to write to various browsers as it is, so it's best to see what is out there and what some of my more tech savvy users are going to be expecting me to support. Â©RobertDM – The difference between Microsoft's and Google's browsers is that Google's actually follows standards very well. Something Microsoft's IE has never done. Djeez, it's unbelievably fast! I'm running it in an XP VM (VMWare in OS X) and even then it feels as fast as Safari in OS X! I must say there are some nice UI improvements as well, which increase the pressure on the competition. Especially Microsoft are going to have a hard time. They're still fixing their lack of standards support, but all others are really working on a next generation of browsers. In any way the users are going to benefit. Downloaded it about half an hour a go. So far, quite ok. Fast and with a minimalistic GUI, a clear focus on the web page you're viewing. Seems to be some problems with rss and popup blocking, though. Also, the installation seems to think I want to install a Swedish version, and it's also insisting on giving me Google reader in Swedish, when I prefer English. A bit annoying. Wow, after a first test drive, I'm really impressed! Super-fast, with a very easy-to-use interface. With Google service integration and some nice plugins, this can be the best thing in a long time! You're probably right, but one can always hope for a change in the long run. Good point! The Google beta state fixation has to stop for this to be taken serious. Yes, definitely. However, Firefox is dependent on money from Google for when the search field is being used in the web browser, so it's not like they can cut their biggest income. Yeah, Firebug for Google Chrome would be a dream! It's a valid concern, no doubt. But as pointed out by Andreas above and in other places, Google Chrome being open source, some smart developers would soon alert the world about it if it were so. 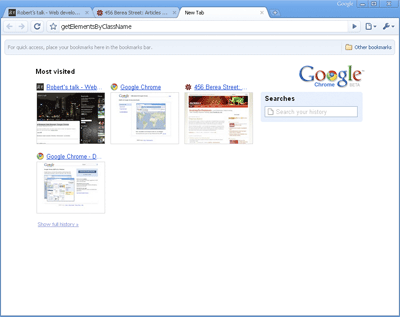 The biggest problem with Firefox is a lack of a menu bar comparable to Microsoft's. I don't see the "file", "edit", "view", "favorites", "tools", and "help" headings. It's imperative I also be able to "send" a site to my desktop or to an email address. The "Bookmark" is extremely limited because the bookmarks aren't divided into organized files that the "send to desktop" option offers you. Can Chrome do any of these?? I really enjoy this, a lot. The one thing I can't understand though is the lack of rss-support. where's google-reader in this app? Chrome already includes a first try of a Firebug- or Dragonfly-like developer tool, so there's perhaps no need for many other webdeveloper plugins. To take a look at the tool just mark any text on a page, right click and then choose the last point in the menu (unfortunately I got the German version so I don't know, how they named that in the English one, maybe "inspect element" or something like that). That doesn't look to bad, but I didn't play around with it a lot either. I wondered that there is something like local bookmarks – they may should integrate the possbility to use some online bookmarking services instead, that would match the bookmarking behaviour of today's web users better in my opinion. I agree, this browser could be an interesting alternative, especially for people using different Google web applications frequently, but at the moment it can't yet compete with Opera. Yes, let's hope it stays good! I think Google Chrome aim to be as lean as possible, but definitely, some of those menu options are important. Very cool, I didn't see that! It seems pretty competent in that aspect too, then. Bookmarking and such will probably come. I can imagine that, in the future, they will implement some sort of integration features, like Flock, but not just as massive. Yes, it'll be interesting to see about plugins.